ab108633 Cancer Antigen CA15-3 Human ELISA Kit is intended for the quantitative determination of the Cancer Antigen CA15-3 concentration in human serum. Breast cancer is the most common life-threatening malignant lesion in women of many developed countries today, with approximately 180,000 new cases diagnosed every year. There are a number of tumor markers that can help clinicians to identify and diagnose which breast cancer patients will have aggressive disease and which will have an indolent course. These markers include estrogen and progesterone receptors, DNA ploidy and percent-S phase profile, epidermal growth factor receptor, HER-2/neu oncogene, p53 tumor suppressor gene, cathepsin D, proliferation markers and CA15-3. CA15-3 is most useful for monitoring patients post-operatively for recurrence, particularly metastatic diseases. 96% of patients with local and systemic recurrence have elevated CA15-3, which can be used to predict recurrence earlier than radiological and clinical criteria. A 25% increase in the serum CA15-3 is associated with progression of carcinoma. A 50% decrease in serum CA15-3 is associated with response to treatment. CA15-3 is more sensitive than CEA in early detection of breast cancer recurrence. Our Abpromise guarantee covers the use of ab108633 in the following tested applications. ab108633 has not yet been referenced specifically in any publications. Publishing research using ab108633? Please let us know so that we can cite the reference in this datasheet. Regarding the CA15-3 elisa kit: the standard solutions are in U/ml. MUC1 protein that you provide is mg/ml. In case we use your protein for an immunoassay and your kit as a reference method is there a possibility to convert mg/ml in U/ml? do you have a conversion factor? or so you know the threshold value of MUC1 for cancer in mg/ml? "We purchased at least 100 CA15-3 patient samples from a vendor(s). The vendor provided us the CA15-3 value for each sample tested by Abbott's CA15-3 test. We then tested these samples using our CA15-3 kits and made sure the values obtained using our kits were similar to/correlated with the values (from Abbott's kits) provided by the vendor. We don't know exactly how much is 1 Unit. There is no universal standard but everyone knows that the cut-off for CA15-3 is 35 U/ml. " Can the kit be used to detect recombinant CA15-3? Unfortunately, we have not tested this kit with recombinant CA15-3 and therefore have no information as to whether it will work with a recombinant protein. This also means that this product would not be covered by our abpromise guarantee if used with recombinant CA15-3. I am sorry to confirm that we do not have any ELISA kits to detect anti-HER2 and anti-CA15-3 antibodies. Coat plates with protein (CA15-3 Human), block, add serum samples of interest (antibodies reacting with CA15-3 Human will bind wash away other antibodies, detect anti-CA15-3 antibodies with secondary anti human IgG + IgM conjugated to enzyme. I am sorry I did not have a positive answer to your question on this occasion and hope that this information is nevertheless helpful. what does 1 U/ml of the standard corresponds to in mg/ml? We purchased at least 100 CA15-3 patient samples from a vendor. The vendor provided us the CA15-3 value for each sample tested by Abbott's CA15-3 test. We then tested these samples using our CA15-3 kit and made sure the values obtained using our kit were similar to/correlated with the values (from Abbott's test) provided by the vendor. We don't know exactly how much is 1 Unit. 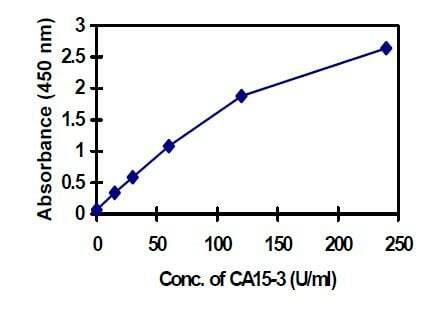 There is no universal standard but it isknown that the cut-off for CA15-3 is 35 U/ml. I hope this additional information is of some more help to you. Please do not hesitate to contact us if you need any more advice or information. There is no WHO standard or international standard for this product. We calibrate the CA15-3 kit against the Abbott's test. I have inquired about more details for the Abbott's test and let you know what I hear back.